"We're looking to go to Kiloran Bay. We haven't been yet." "Your first time on Colonsay?" "Yes, how do you know?" 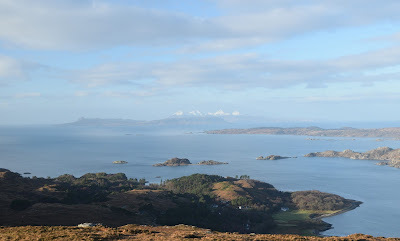 "If you'd been to Colonsay, you'd have been to Kiloran Bay." 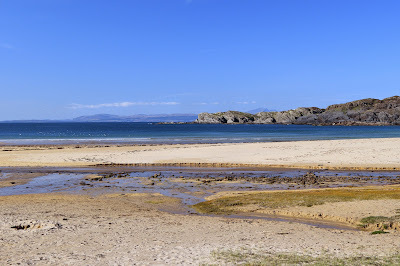 Kiloran Bay is Colonsay's best known feature. In 1904 Donald Smith - Canada's richest man and recently ennobled as Lord Strathcona - was on holiday in the Hebrides with his wife Isabella. She reputedly fell in love with Kiloran Bay, so Donald bought the island. It is in the possession of his descendants today. They preside over what seems, from a tourist outsider's view, to be a well-run community. Their base is the attractive 18th century Colonsay House, a wonderfully lush place for a windswept island. Colonsay is known for its bird conservation, but for me the real bird of the island is neither chough nor corncrake but the cuckoo, abundant thanks to the surprising number of trees for the Hebrides. 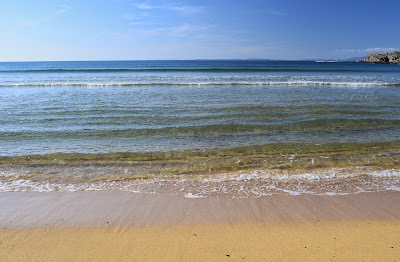 The beach itself is a lovely stretch of pale yellow sand, orange when damp, and calling anyone with any aquatic bent whatsoever to go for a swim. We walked its length, lazy waves lapping the sands. Now to some, this is the finest beach in Colonsay. But not everyone thinks this. Had a **** You bird outside my tent from 3:30 am until 9:00am when I went up the hill. At least I think that was what it was calling. Kept it up for the next two nights as well along with a couple of nesting crows above the tent. 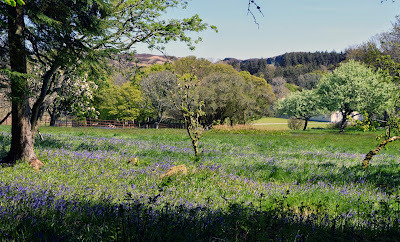 Spring in the highlands is not without its unexpected pleasures. That's a good reminder, I am off to Faroe next month and will be camping. I had better take earplugs (and an eye mask)!